1. Give it a home! Take a look around your house, what stands out the most to you? Do you have lots of random papers everywhere? Kids toys? Dog treats? Shoes? Give these items one specific place and keep them there. For example, when you bring in the mail, have a designated place for it to go so that papers don't pile up around the house. 2. Start clearing a starting zone. Give yourself a starting point. Depending on how ambitious you are it could be a high-traffic area, or a smaller space in the home. Make this one area completely clutter-free. Once you're done removing the clutter from that area (no matter how small or large), keep it clutter-free and keep expanding the space until your whole house is clutter-free! 3. Clear off a counter. I think this is my mother's favorite de-clutter rule. She will not go to bed until all of the counters and tables are cleared off and everything is put away. This is a great rule to live by because it's much harder to keep clutter if you have no where to put it! If you're like me, and love to leave stuff everywhere because "I'm going to use that again in a little while", it's best to start small with one counter and work your way up to all of the flat surfaces in your home (tables, kitchen island, etc.). 4. Pick a shelf. This is great if you only have a few minutes. Pick one shelf in your house every day and make it clutter-free. Get rid of all of the things that don't belong. Either throw them away, put them in their proper place, or donate them. You don't have to do all the shelves in one room or on one piece of furniture, just clean one shelf. 5. Schedule a decluttering weekend. Ask a friend if you can borrow their truck one weekend, and block off one weekend for the family to de-clutter the house. Pick up some boxes so you can choose what you want to stay, donate, throw away or relocate. Make sure that each room has four boxes so that the items in that room can be categorized. At the end of the day, haul the throw aways to the dump and take the rest to Goodwill. If there are some items that you aren't sure about - you don't want to get rid of it per say, but you don't want to stare at it every day either, make a "maybe" box. Put everything you're unsure of in the box, and store it in the attic. Then, put a note on your calendar in 6 months and decide what you want to do with it then. This give you an opportunity to see how often you actually use those items and how badly you want to keep them. *You also may want to add a 5th box, if you want to have a yard sale - but make sure you actually set a date for the yard sale and follow through. 6. Re-learn how to buy. One of my friend's had a rule growing up, that he wasn't allowed to buy anything with his allowance the day he saw it. He had to wait a month before making a purchase, that way he knew that he really wanted it. What a great idea for his mom to instill in him at such a young age! It's so easy to go by the $5 bin at Wal-Mart and pick up several DVD's that you have wanted forever and they always end up taking up more space and you only watch them once. Instead, make a list of things that you want to buy while you're out that isn't a necessity, and put them on your calendar. After 1 month, if you can't get that item out of your head, go get it. Most of the time, they are impulse buys and this will save you lots of money and clutter! 7. Teach your kids where things belong. This only applies to the parents among us, of course, but if you teach your kids where things go, and start teaching them the habit of putting them there, you’ll go a long way to keeping your house uncluttered.There is nothing worse than stepping on a Lego at 2am and trying not to wake up the whole house - just to go to the bathroom! Of course, they won’t learn the habit overnight, so you’ll have to be very very patient with them and just keep teaching them until they’ve got it. And better yet, set the example for them and get into the habit yourself. 8. Pull out some clothes you don’t wear. You may have seen this on Oprah. Take all of the clothes in your closet and turn the hangers around backwards. At the end of the year, anything not turned back needs to go to Goodwill. Let's face it, if we haven't worn it in a year, then we probably will never wear it again. You can something similar to your drawers, and just put the clothes in upside down (have the folded half of the shirt face the back of the drawer instead of the front). 9. Clear out your medicine cabinet. If you don’t have one spot for medicines, give them a home! Clean out all of the expired medicines, anything that is empty, trash, etc. Only put medicines in here that will be used regularly or are not out of date (pain relievers, blood pressure medicine, band aids, etc.). And no, the Vodka and Bourbon don't belong here! 10. Pull everything out of a drawer. Just take the drawer out and empty it on a table. Then sort the drawer into three piles: 1) stuff that really should go in the drawer; 2) stuff that belongs elsewhere; 3) stuff to get rid of. Clean the drawer out nice, then put the stuff in the first pile back neatly and orderly. Deal with the other piles immediately! Often, we think of spring as the season for cleaning and organizing. But, why not use fall as a time to do the same? With the change of weather (and clothes) and the holidays in the not so distant future, use this season as a time to clean up and clear out the clutter. Fall and winter bring colder weather. Swap your warmer weather attire for your cool caps, scarves, boots, sweaters, and coats. If you have the advantage of having a separate closet, use it! Separate closets can be a great way to divide your bulky coats and hats from your soak-in-the-sun wear. If this is not an option, consider using cotton garment boxes or large zippered plastic bags. Not every person has the privilege of having ample space for every item. 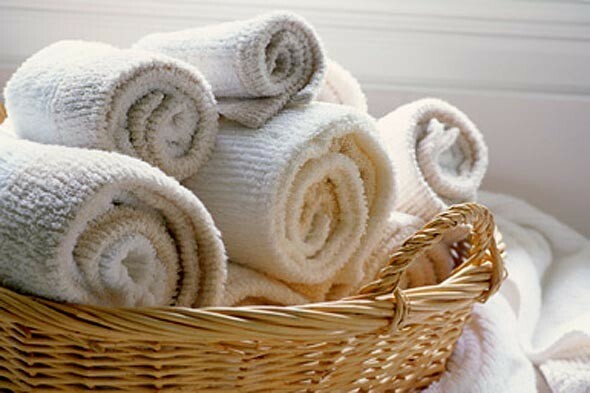 However, you can expand your space by rolling your towels (or any other fabric item). Use the space you save with your towels to make room for items like toilet paper, cleaning supplies, an iron, or other toiletries. Between mail, recipes, coupons, receipts, and other documents, paper items can cause a lot of clutter. Consider scanning important documents, such as receipts, bills, and recipes, into the computer to relieve yourself of paper overload. If you prefer hard copies, designate a drawer with folders to hold your hard copies. Also, be sure to get rid of any junk mail that may come through the door by trashing it or shredding it as soon as you receive it. If you collect coupons, check your assortment each week and get rid of expired or unnecessary coupons. Don't allow past seasonal items to take up precious space. Organize your seasonal items in bins and drawers. For Christmas items, consider this method of storage. You can also use crates and clear bins to store seasonal decor. Consider using a four drawer system (one for each season) to organize the seasonal nick-knacks. While you organize that coffee table that has had the same magazine and vase since moving in, be sure to take advantage of your time. While you focus on organizing different areas of your home, clean them too. You'll feel like you moved into a new home! Although we can tend to have cleaning binges, why not delegate certain days to clean certain rooms. This way, you always end up having a clean home at the end of the week. After putting in a few hours of cooking, most of us don't want to clean up the mess we've made. However, saving it for later only creates more work. Do yourself a favor and clean while you go. Once you've used something, clean it! It will allow more time for you to invest in the people and things you love. Feeling like you don't have enough space even after you organize, consider built-ins as an option. They are custom made to your taste, functional, and they add space without having to add square footage to your home. The other option is to consider donating those items that you don't need to a local shelter or store. With the holiday season and colder weather around the corner, many individuals can benefit from your donation.